It was a happy week, except for the scary jolt on Thursday. 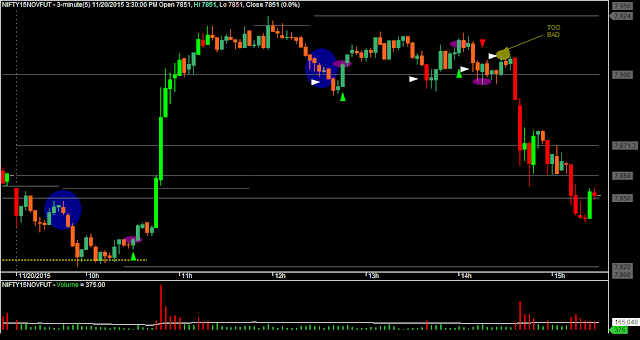 This always happens when I trade mechanically. Every once in a while, a day comes that make me lose confidence. The SL hit on today's trade 4 was just too bad. My SL for the short was 7908. Price came to EXACTLY that point and reversed. This stuff keeps happening all the while with this system. 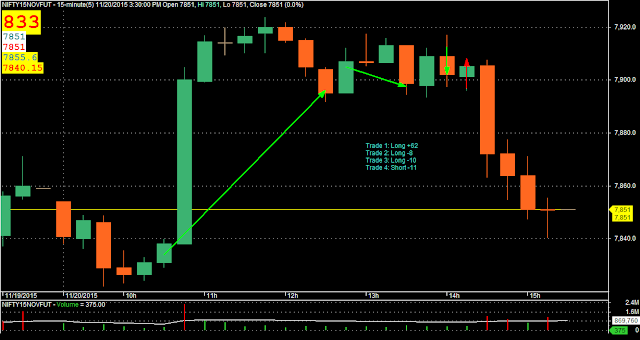 The M3 chart below is what I was live tweeting throughout the day. I live tweeted today. Follow me on my twitter handle @BakwaasTrading. I have also added a live tweet widget to the right pane of this blog. Check it out, though I cannot promise that I will keep live tweeting every day. Forgot to mention that I traded the M15 charts on Friday, though I had mentioned it on my twitter timeline before the start of trading hours.